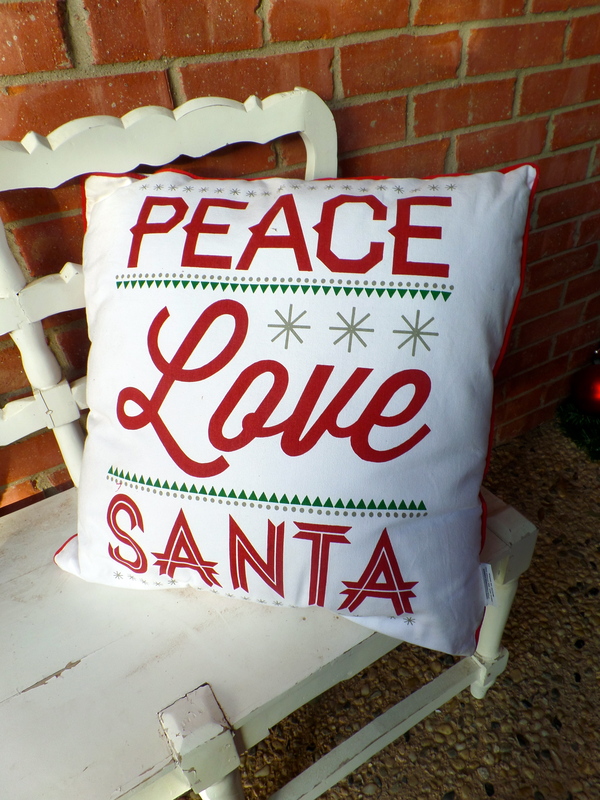 Mantels and fireplaces are great areas to decorate for the Holiday season! 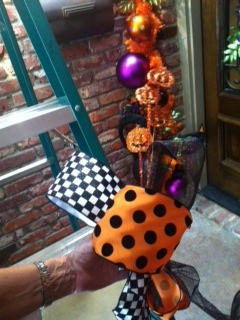 Theme: Halloween, this years color story for Halloween is orange and black, with a pop of black and white! 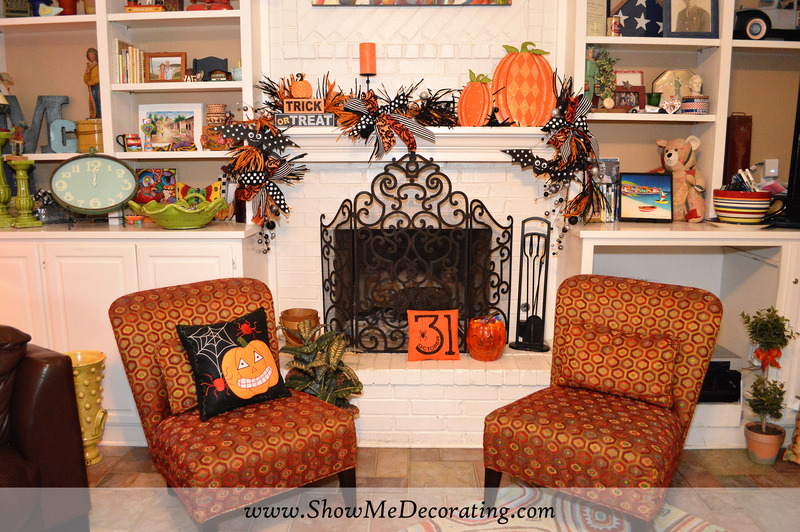 This white-painted fireplace and mantle show off the Orange and Black used in Halloween decorating! 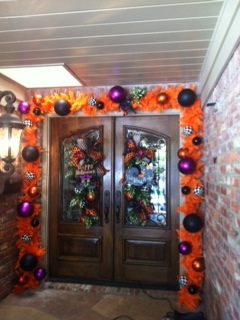 A great base for the mantel decoration is a garland to work in and out of the Halloween decorations. 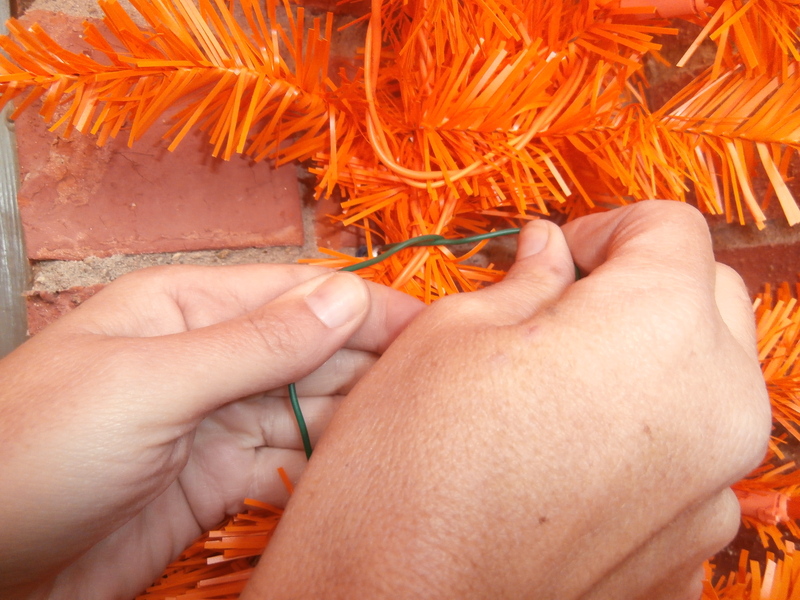 Start with a Twister grass garland and glitter ball garland. 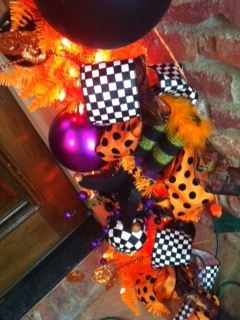 Using two garlands twisted together is a great backdrop to the Halloween blocks, pumpkins and candle holder. I like to use a group of three. Next add the finishing touch, ribbon. 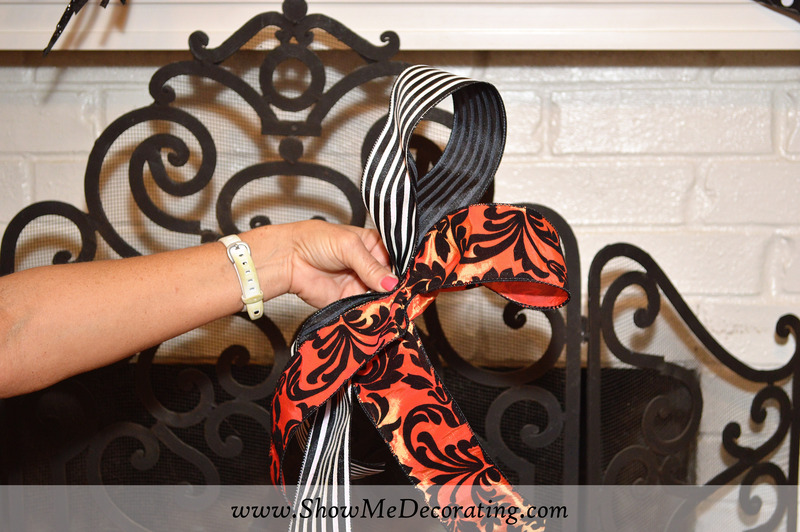 3 ribbon patterns combined in a half bow are a great finishing touch to the mantel garland. 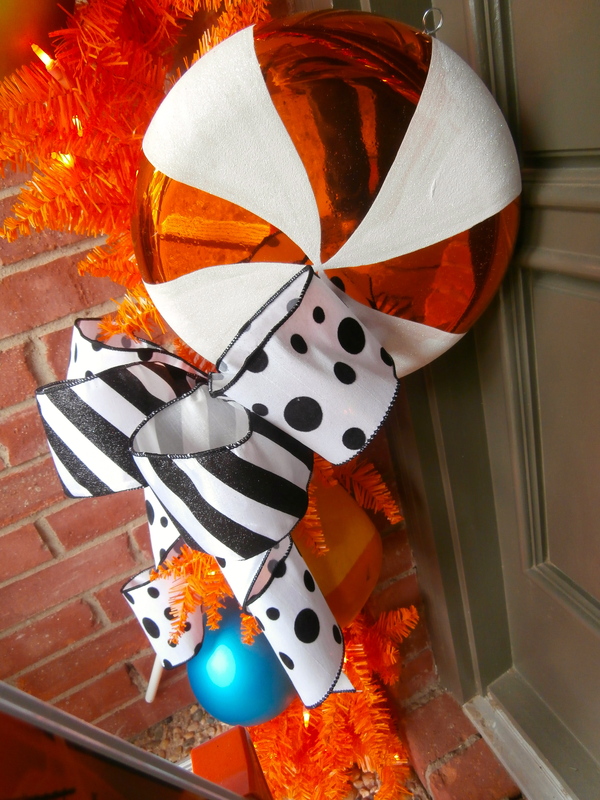 Make a loop of orange and black, and add a stripe black and white ribbon loop, secure with a floral wire, tie a strip of Black and White polka dot over the middle. 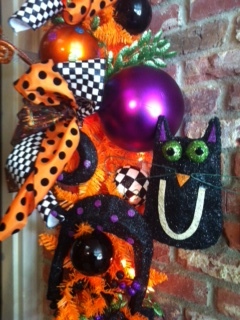 Wire the half bow ties into the garland, wire on the Polka Dot Bats and the Halloween mantle is complete! 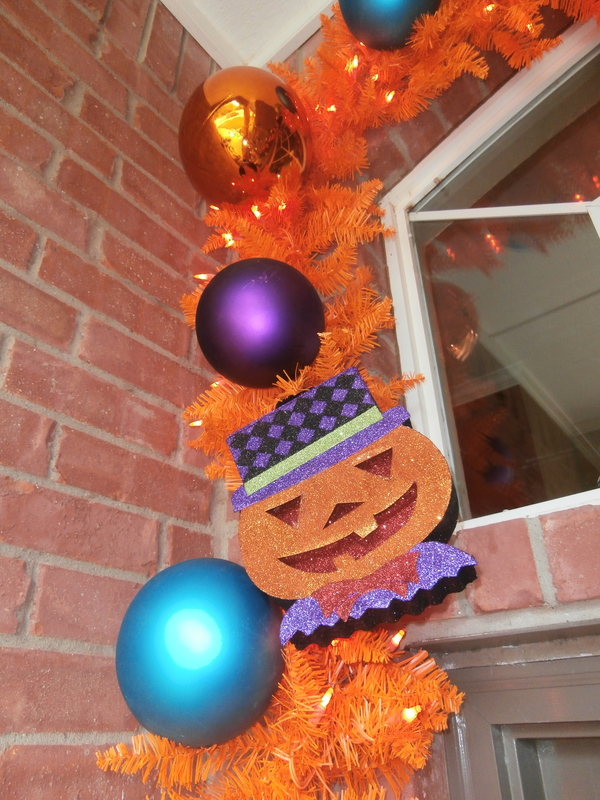 Show Me Halloween Garland How to Tricks and Treats. 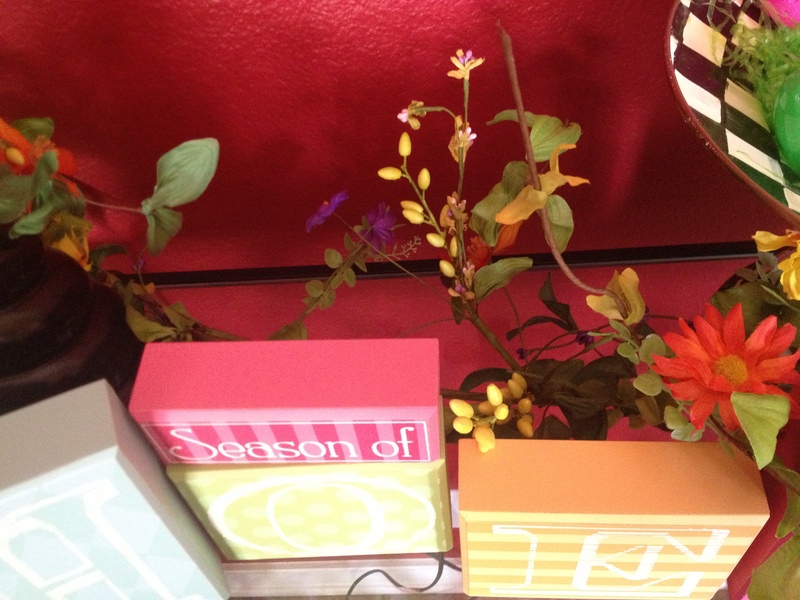 There is a slight chill in the air (or so I imagine)…..fall is on it’s way! 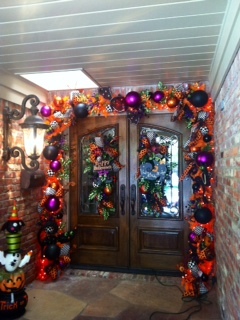 Halloween garlands are a great way to decorate your doorway for the fall season! 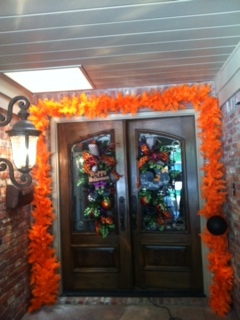 Bright orange Halloween garland with pops of purple, welcomes ghost and goblins to stop by for a treat! Make a great first impression by creating it yourself! Decide on your theme or color story , measure your door or entrance way, and shop from home! 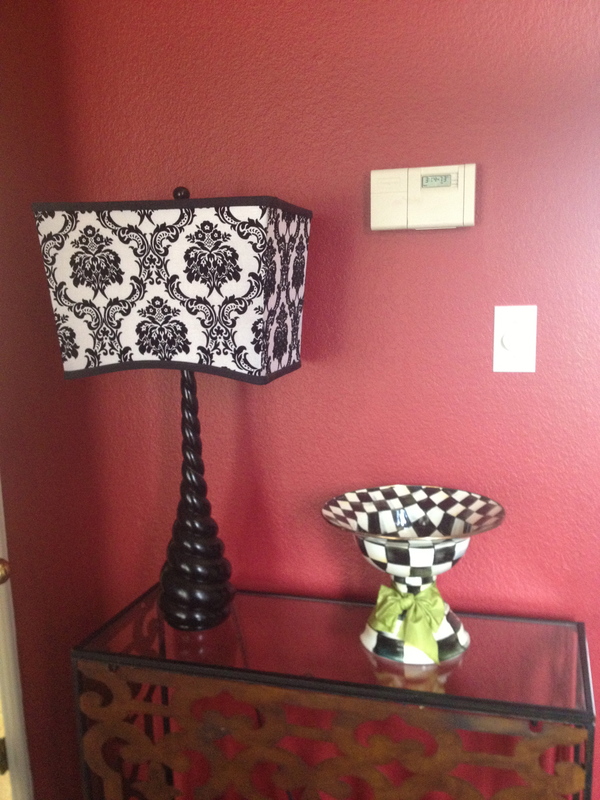 Visit our new online store at ShowMeDecorating. 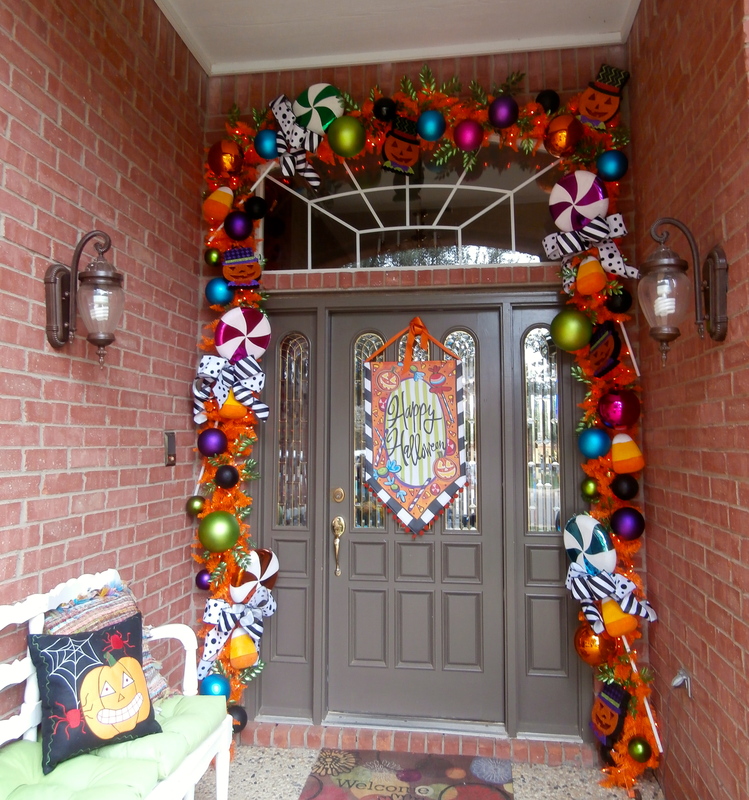 We love to install permanent screws or nails around the doorway, leave them in and you are ready to decorate seasonally! Use nails if you have wood surrounding the door or entranceway, paint to match. Purchase @mollybolts at @lowes or @homedepot or your local hardware store. 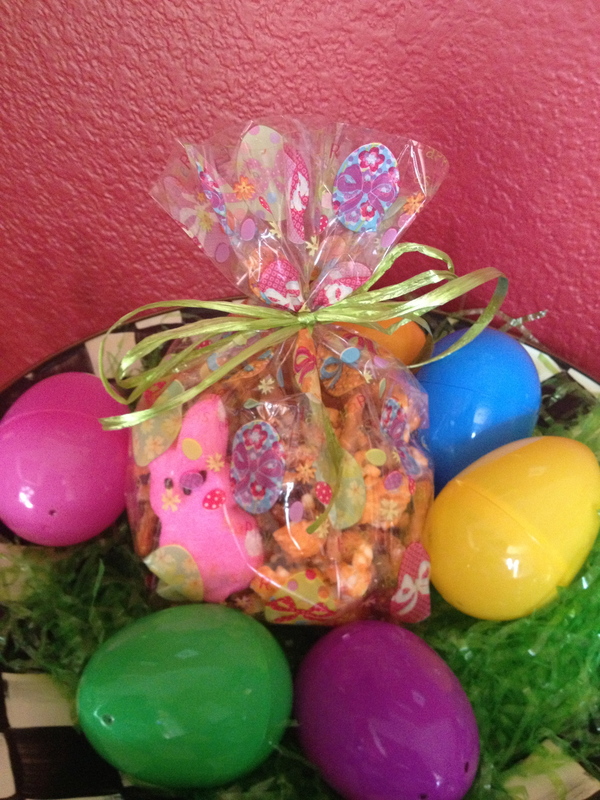 A good quality base will hold all your treats with our tricks! 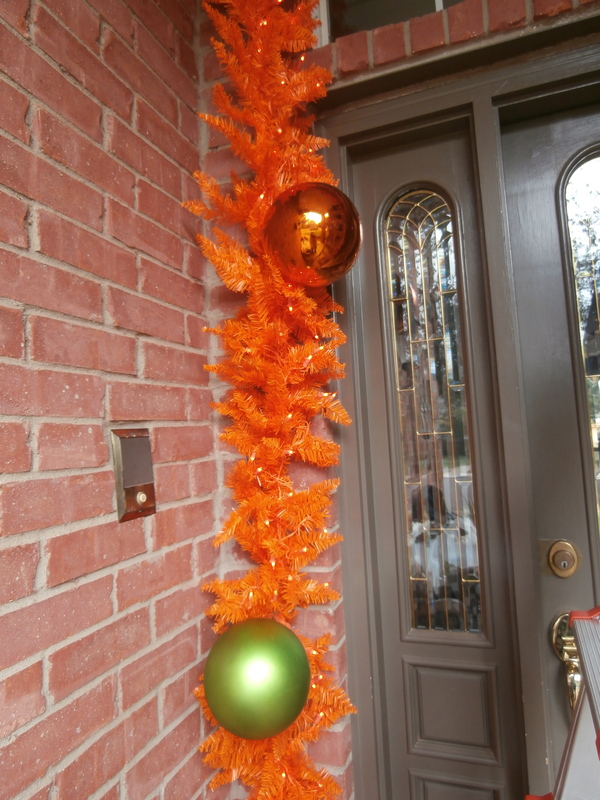 The bright orange pops against this entranceway. 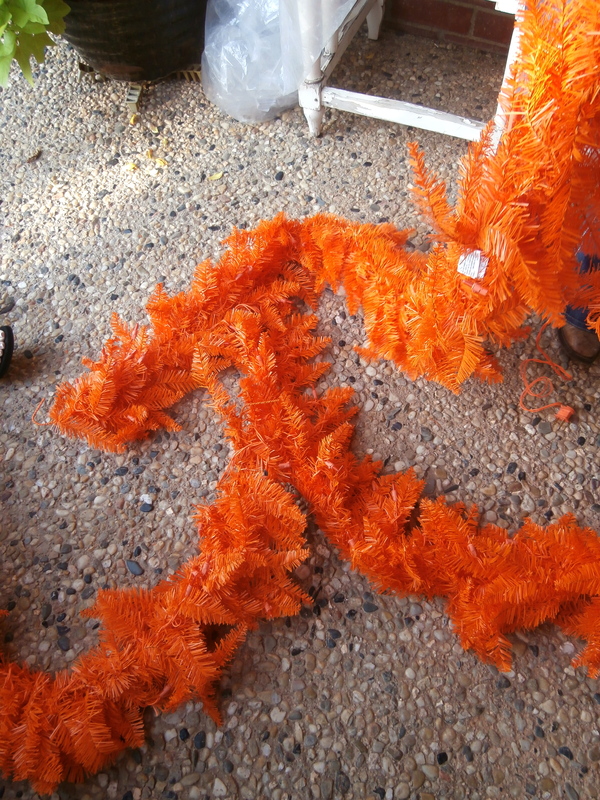 Most faux garlands are 9′ long and can be wired together or cut to match your measurements. The next ingredient is balls! 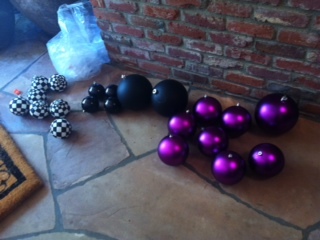 Balls (not just for Christmas!) 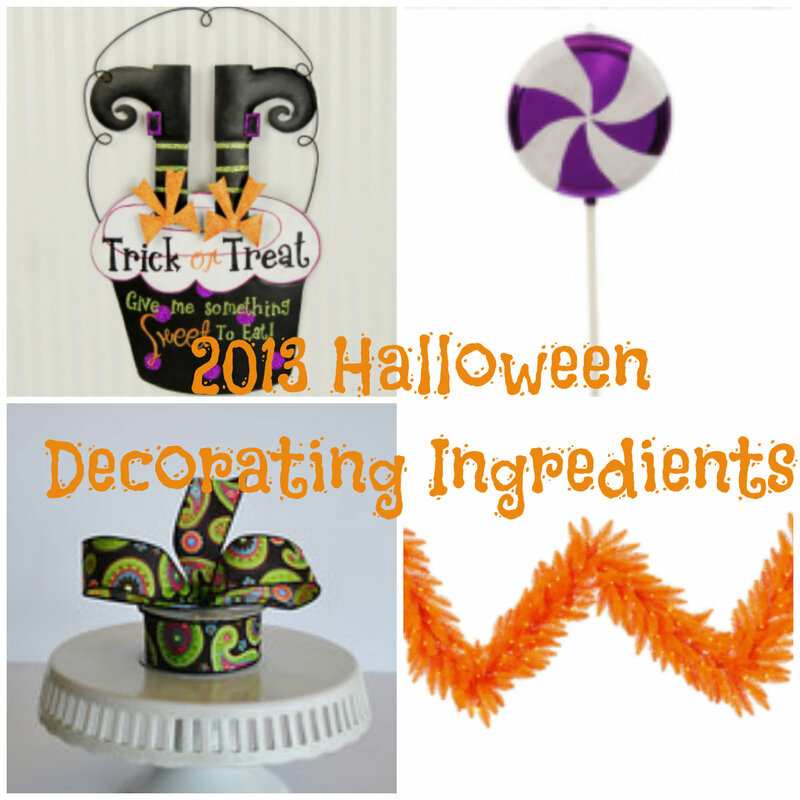 are a great ingredient in Halloween colors. 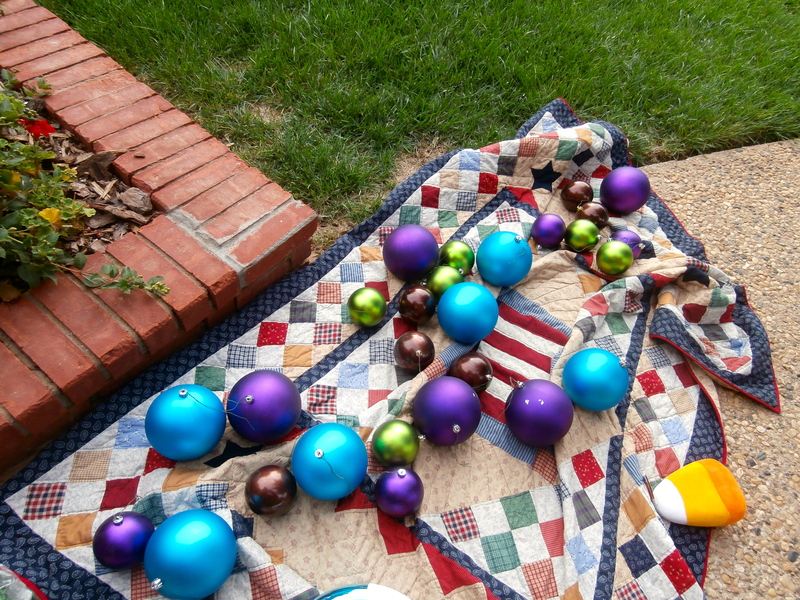 Space the balls out and use a variety of sizes, wire in place. We love odd numbers. 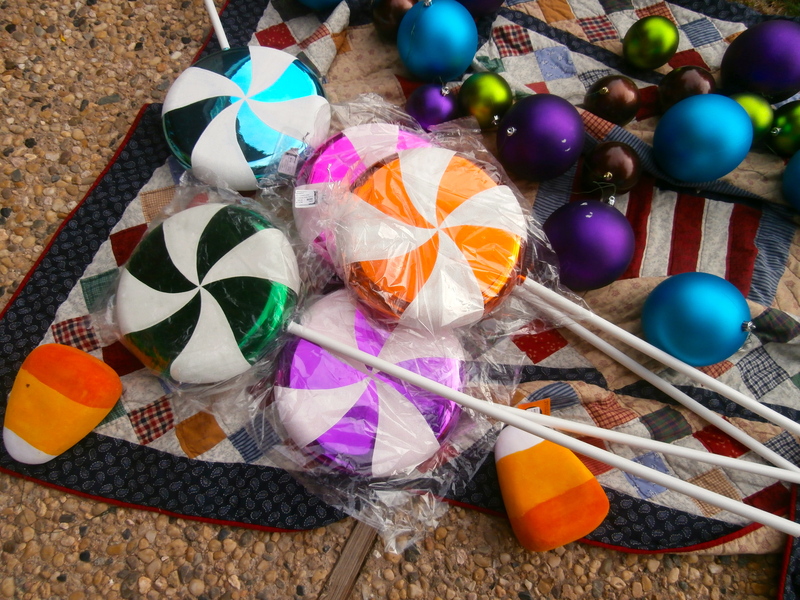 Our exclusive Black and White Balls add a pop! 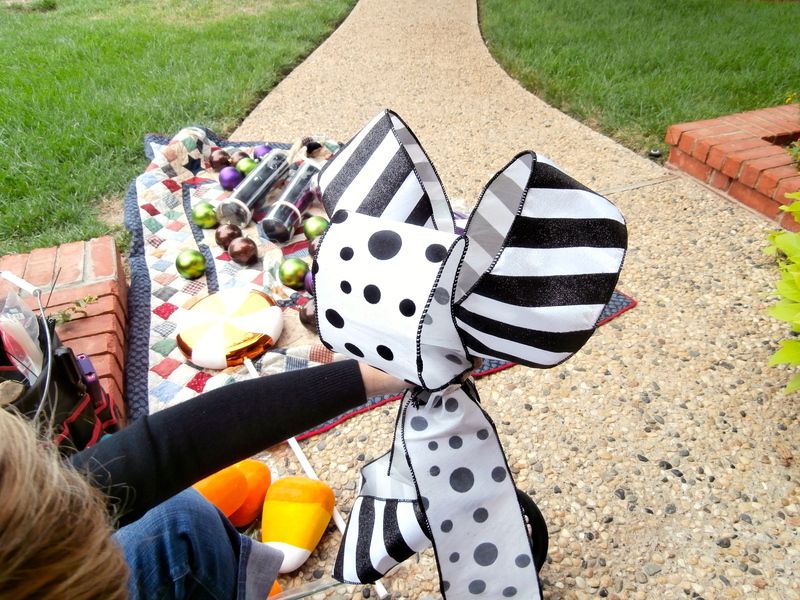 Ribbon loops and tails are attached to fun picks and sprays and wired onto the garland base. 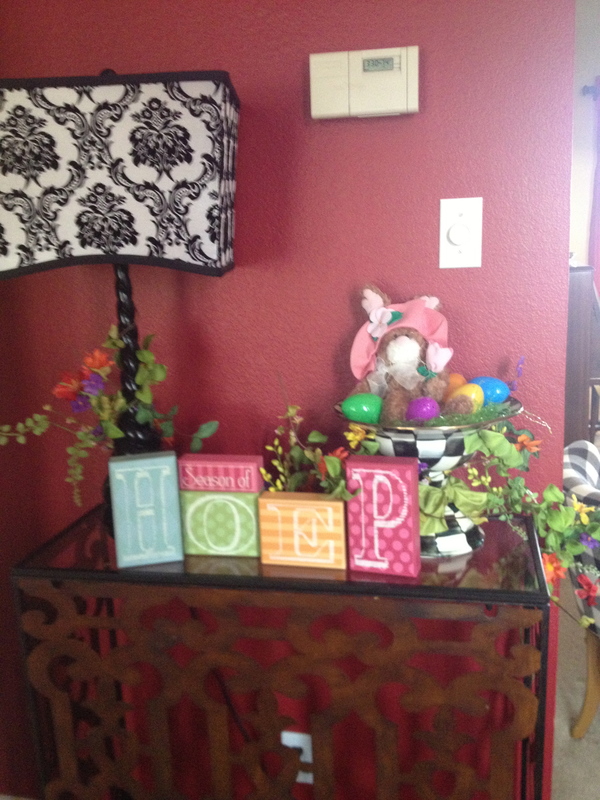 Add fun focal points and your are done! Matching teardrops complete the look, now it’s time to buy some candy and watch for some Ghost! 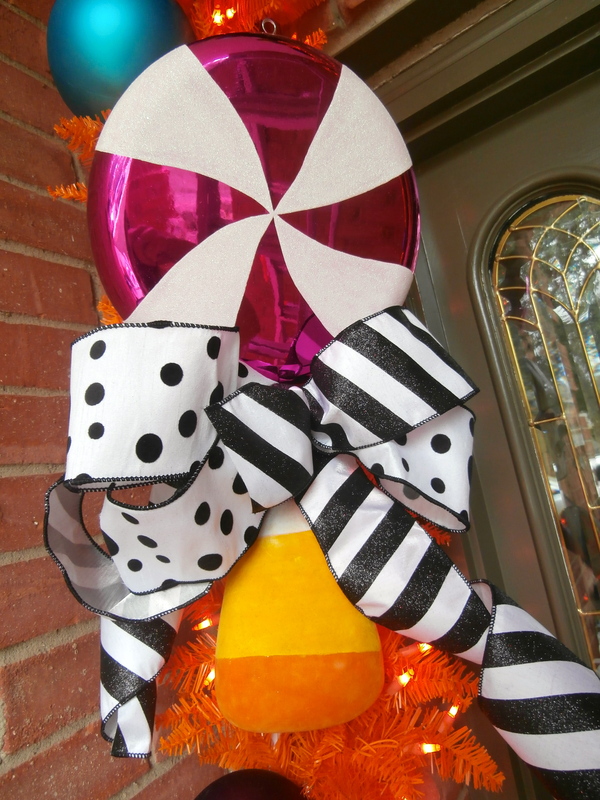 Shop our Halloween selections and enjoy decorating your favorite Haunt! P.S. Store all your goodies in a clear tub marked Halloween. 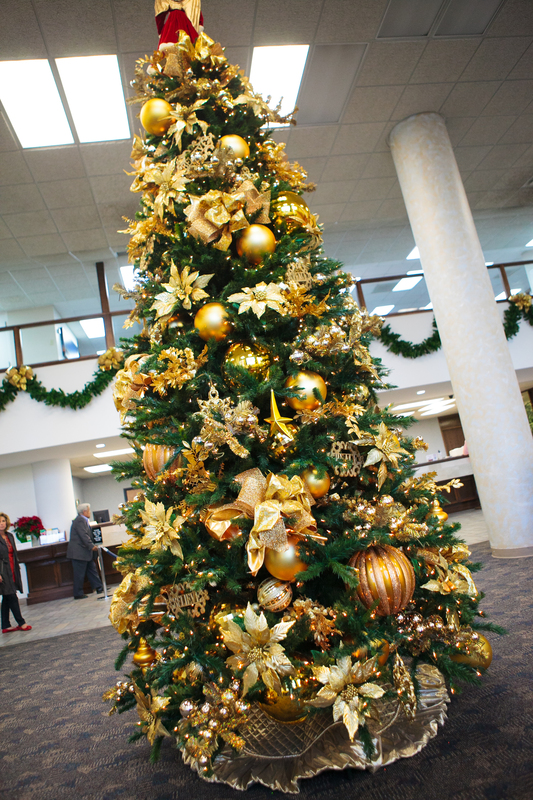 Opportunities to be a part of the community and benefit organizations and charities are always taken around the holidays. 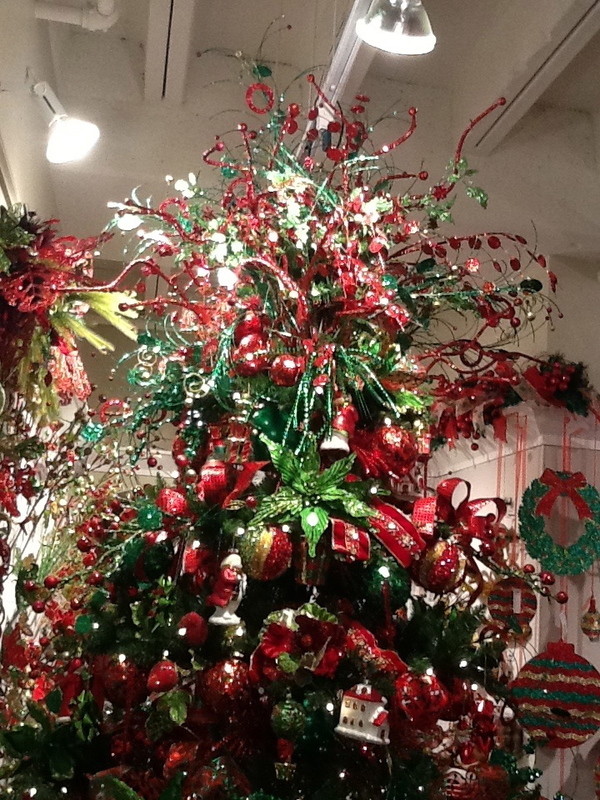 Museum of the Southwest hosts Christmas at the Mansion every year and local stores and designers help to decorate the areas at the museum. Large decorated garlands festively decorated in red and green hang over the doorway. 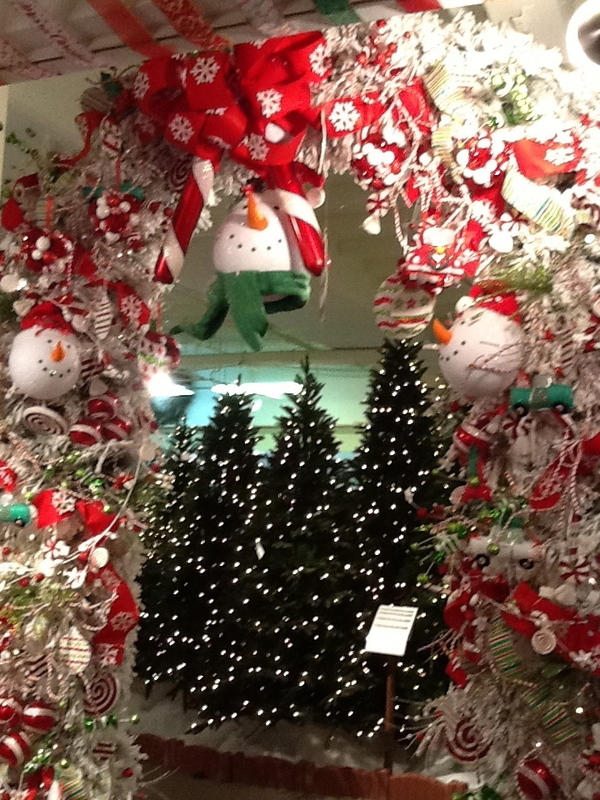 Topiaries dressed up with lit packages, stand guard beside the door and welcome guests. Inside furniture from a local interior designer front is show cased in the parlor and sets the stage for a beautiful flocked tree. A palette of olive green, lime green, and reds, black and cream paper mache balls, burlap ribbon tied with cheetah print velvet and tufted metallic olive green ornaments assist in the decoration of the tree. 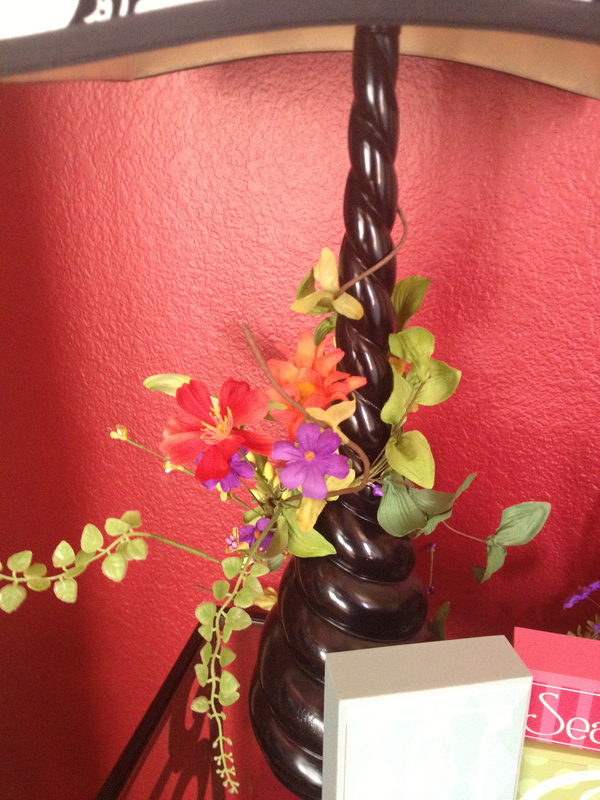 The choices of the decorations add interest and texture to the unexpected mixture. A beautiful wow for all to see. 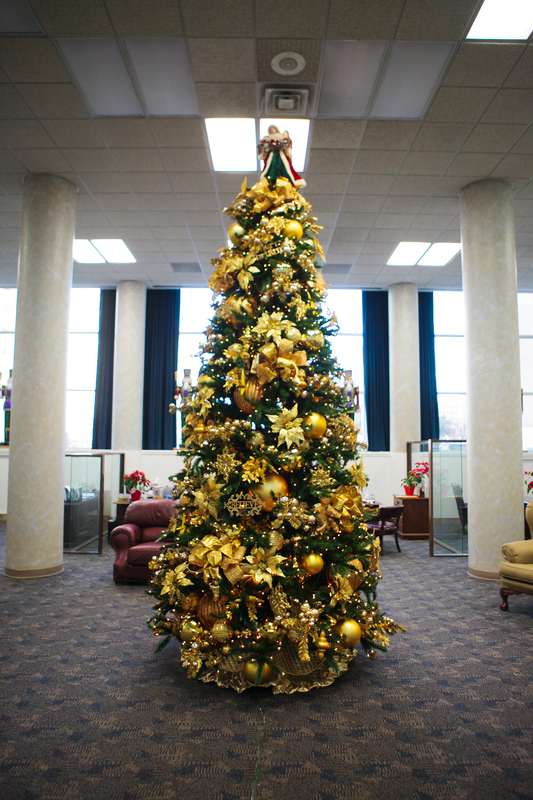 Patrons of the museum decorate areas and trees as well. This gingerbread town with a presiding snowman as mayor is festive, fun, and colorful. Turquoise adds a pop that is unusually delectable. Lime green, pink, and turquoise ribbon look so yummy with the traditional red and white. 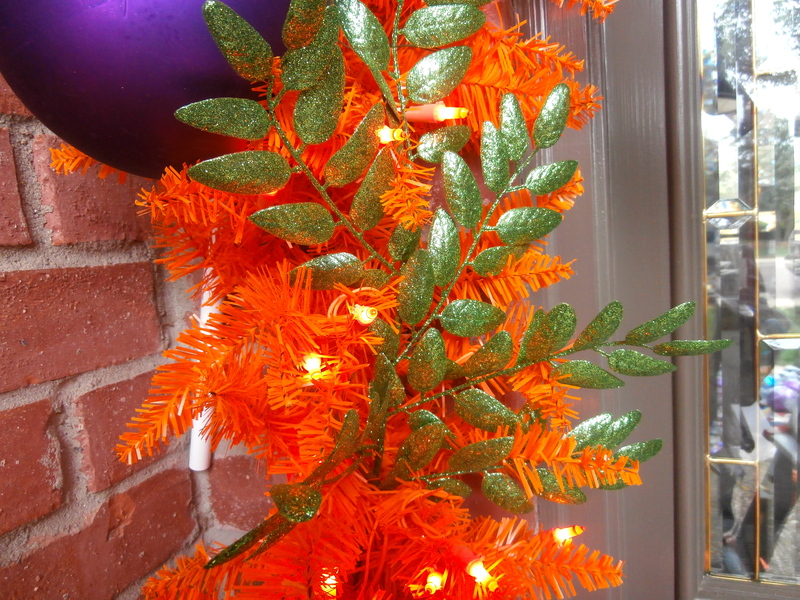 TIP: Mesh fabric used as ribbon tied in loops and woven through the tree is colorful and works as great filler. Starting at the top and working in a spiral around the tree downward tuck the mesh in and out. How to use Christmas mesh? DECORATING TIP: Lime green is almost as popular as Christmas green and certainly adds a fresh bold color to any tree, wreath, or garland. To add zing all over your project use in multiple numbers distributed throughout. This was the second year to work with this client. 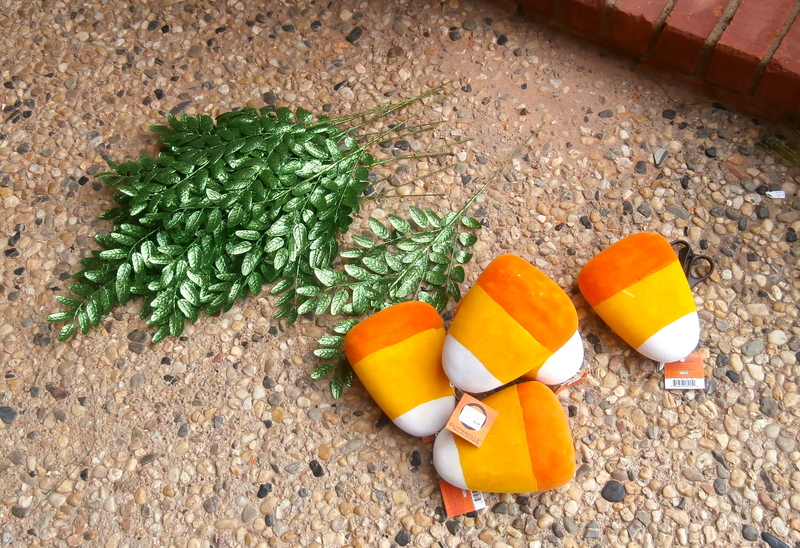 We helped her to welcome all guests to her new home in the Christmas holidays. 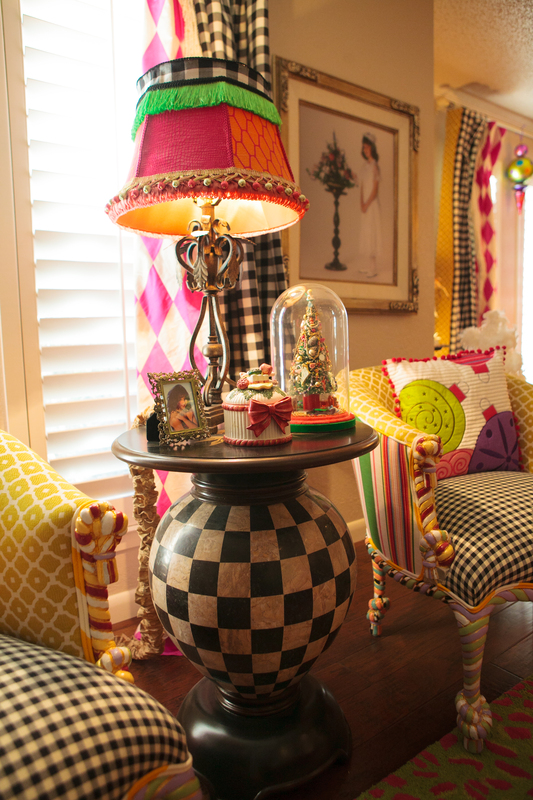 She wanted clean lines with touches of the unexpected and funky fun looks. The front was a beautiful entry way styled with frosty teardrops, and covered by a fancy balcony. The grand living area has a natural and frosty look. The garland featured frosty icicle branches and beautiful pinecones. There are many great red accents in the house, so it was easy to add these red pencil trees to the foyer and shirts of red mesh completed the look. She wanted traditional colors in the family room which worked beautifully with the existing furniture. I mean really it is hard to beat the look of red and green at Christmas time. Matching garlands over the hutches and mantel make a beautiful background for the tree. The centerpiece on the island look like a fresh collection of plants but it is an eye catching arrangements of permanent botanicals. 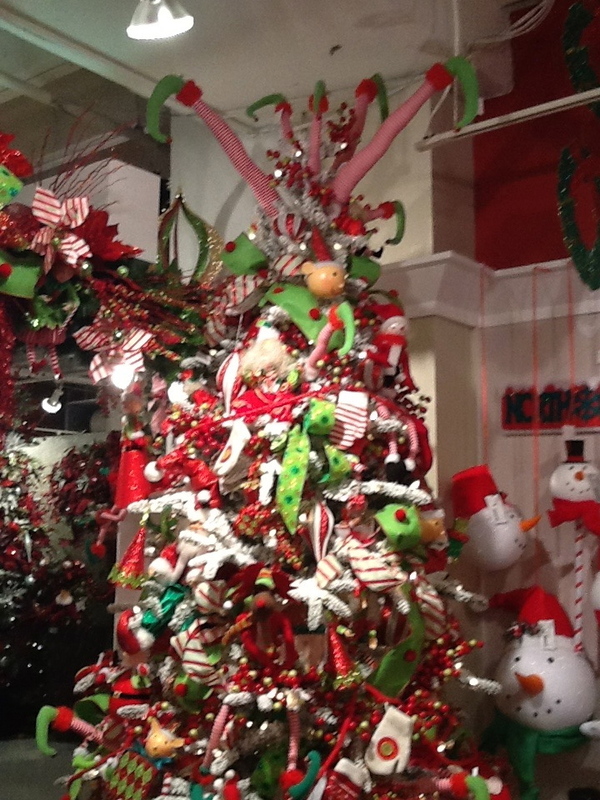 The kids play room has a kid-friendly tree with some of their hand-made ornaments. 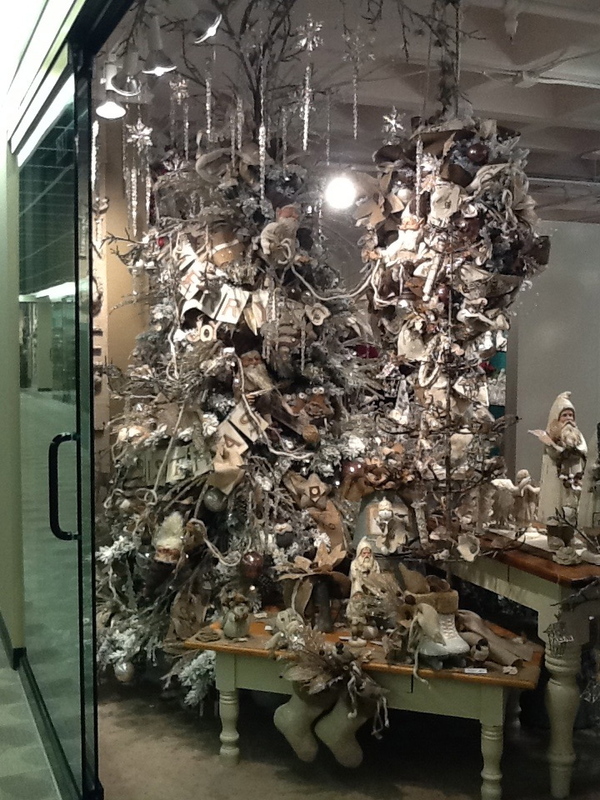 The tree also showcases their collections of snow village pieces. 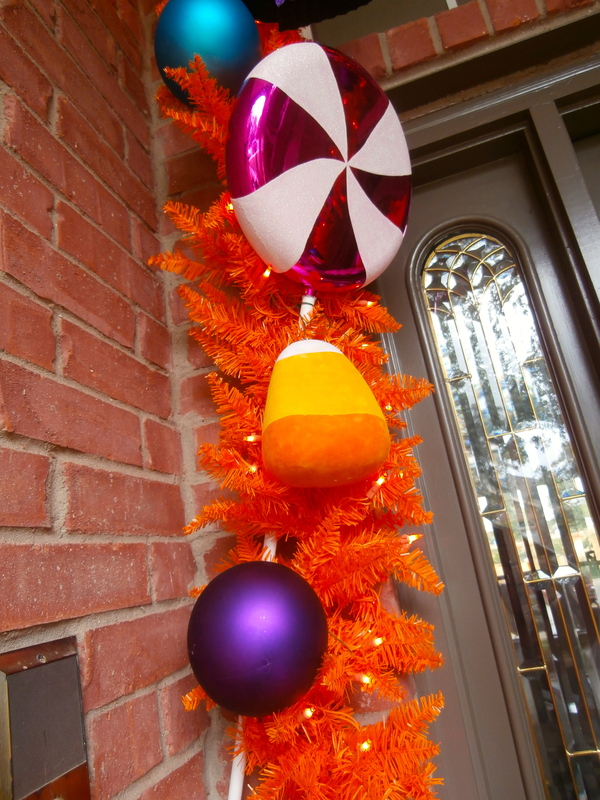 The patio has yards and yards of fun-lit-garland with Seuss-colored ribbon and ball garland. There is a touch of Christmas magic at every turn in this home. Elegant traditional with a touch of whimsy will please any age. 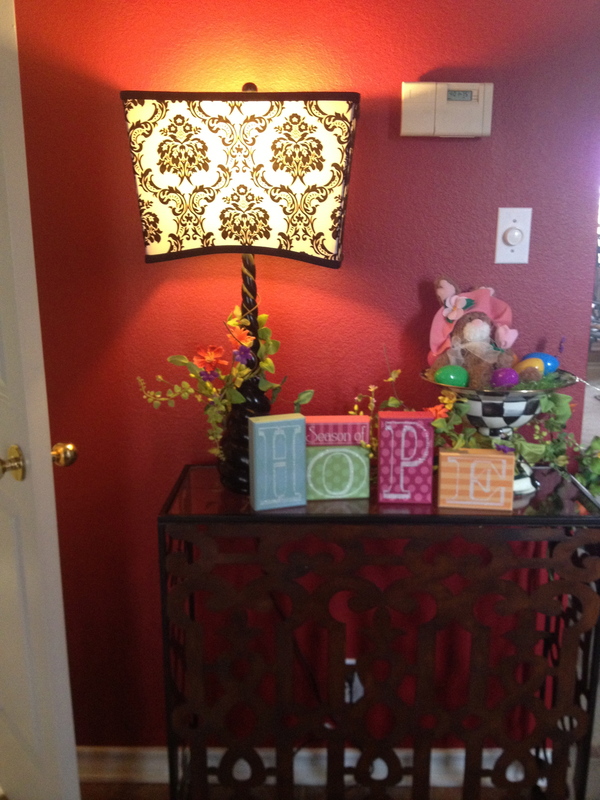 These home owners recently became grandparents and wanted a child pleasing welcome for their grand front entrance. Lots of classic green and gold were used to compliment the buck and traditional style of the home. 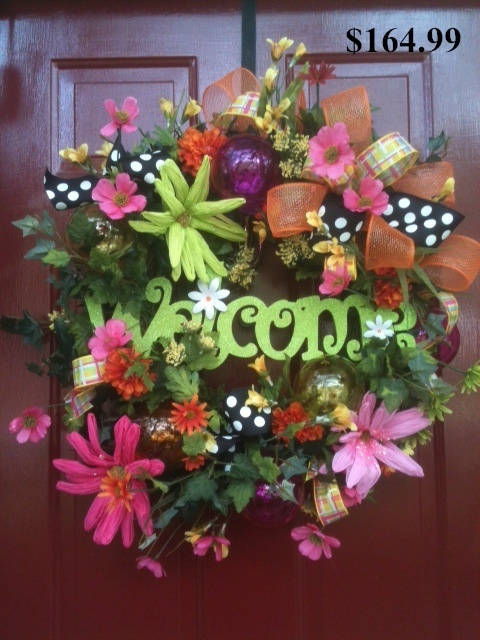 Whimsical signs with lots of white were added to the garland wreath and door way for a lively touch. A personalized Santa list, on this wreath, will have family and friends checking to see who’s naughty or nice at the side entry. 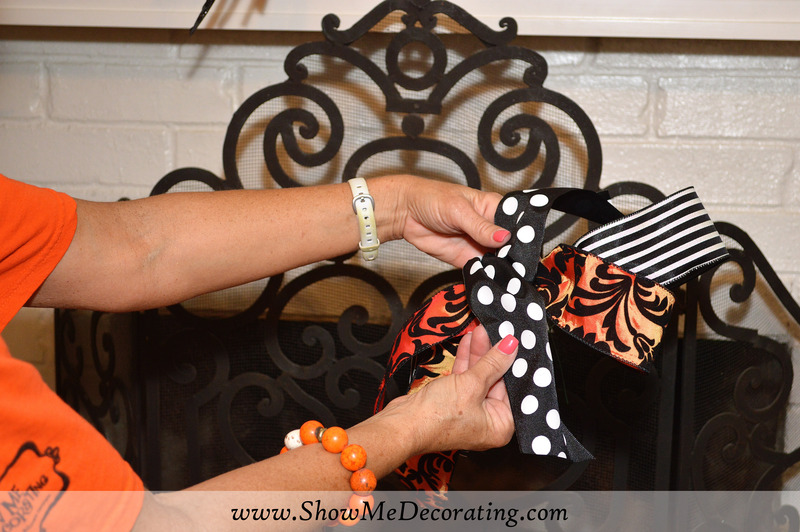 Tip: Painting a door black will give your home a dramatic curb appeal and is the perfect back drop to great seasonally designed wreathes and teardrops using the Show Me Decorating techniques. Do you like to Create? Creating is fun especially when the guesswork is taken out! 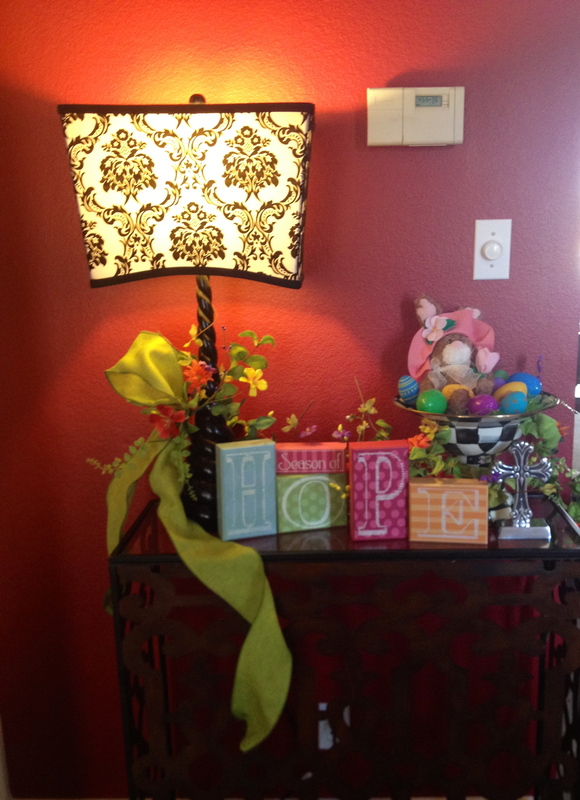 At Show Me Decorating, our philosphy is Create, Educate to Decorate! 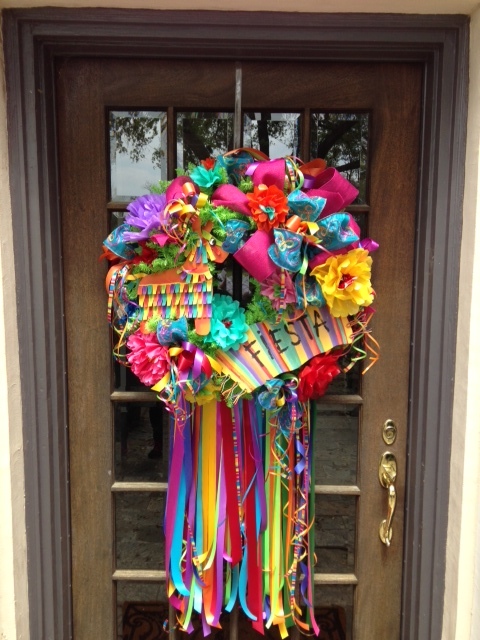 Today, we want to Inspire you to create a Fiesta or a Spring wreath. We are bringing together our favorite vendors to provide you with exceptional materials to create fabulous wreathes, garlands, and in just a few months Christmas trees! 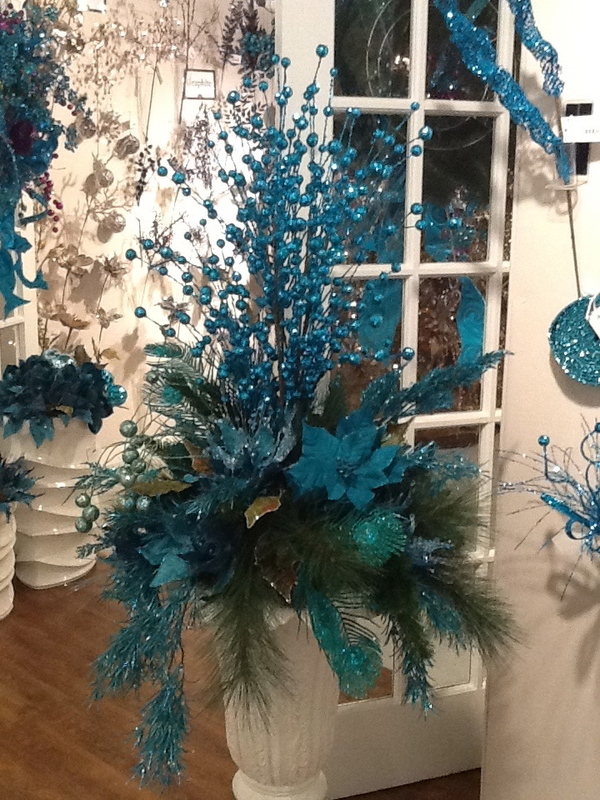 To create a Show Me Decorating wreath-you need a quality wreath base to work in floral, focal points, and ribbon. 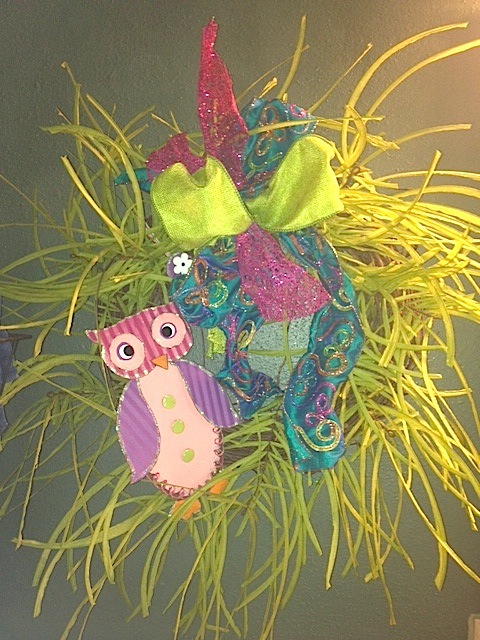 Wired Ribbon for Wreathes and More! Florals are next. Depending on the size of your wreath, you’ll want a variety of colors and shapes or you can go monochromatic and use all of the same color. 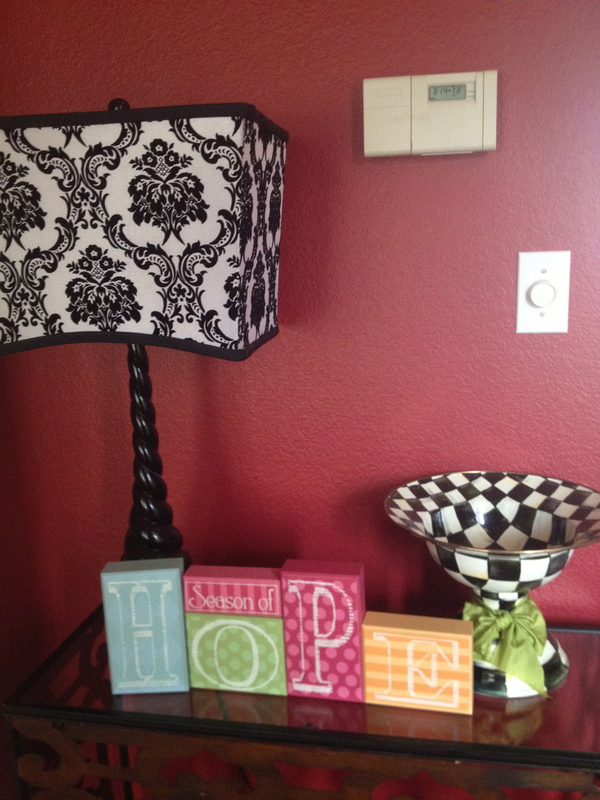 Focal points add a POP of color! 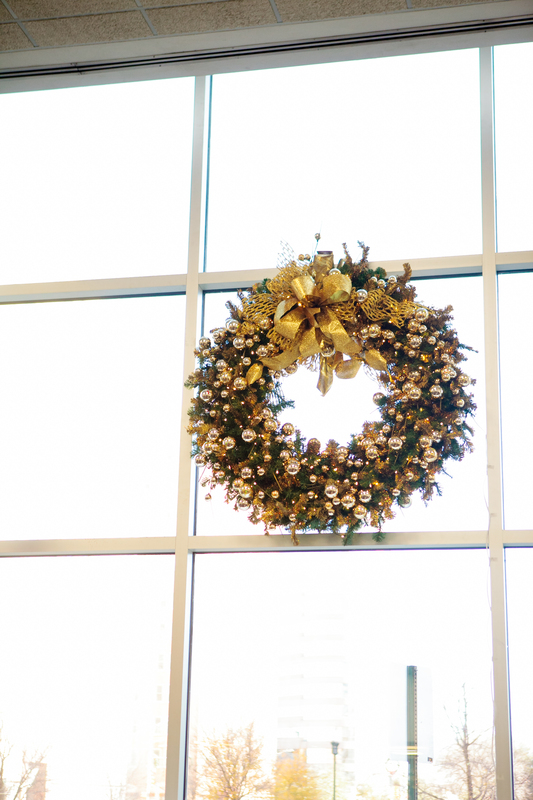 Now, that you have all of your ingredients -get ready to place them on your wreath. 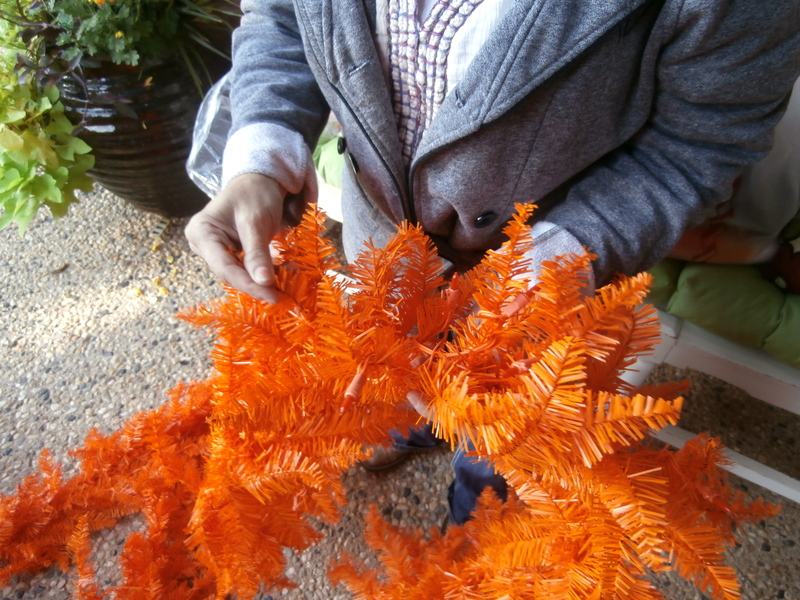 You want to be sure and shape out the wreathes and flowers. Remember, every flower has a face so shape and place where the flower face shows. 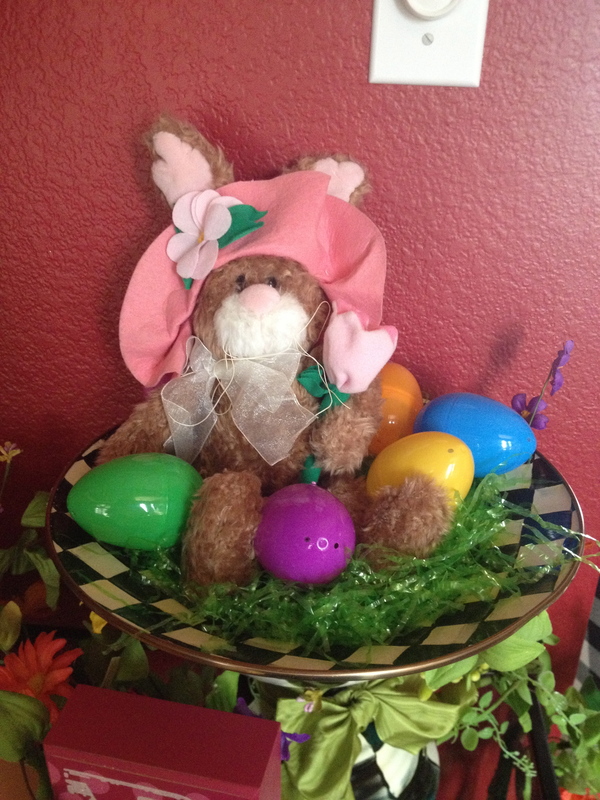 You will place bow, florals, and focal points in a triangle. You are ready to fill in the gaps with more florals and half bows. Almost done-now step back and see if your wreath is balanced and full. You may need to rearrange to your liking. We love to create and inspire you! 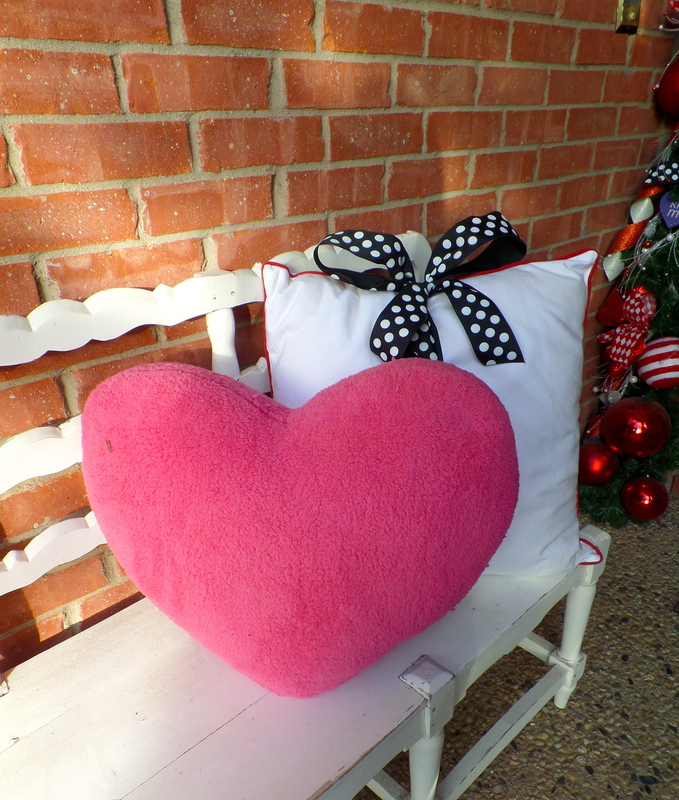 Sharing is a great way to spread the love of creating-share with us what you have been making and we would love it if your click on the share button below and tell your friends about Show Me Decorating!